Blossoming zucchini at the Farmers Market | Pasta & Co.
One of the pleasures of summer for me is eating zucchini blossoms. Tossed in a pan with their young zucchini and saffron, they are the perfect dressing for a summery dish of tagliatelle. 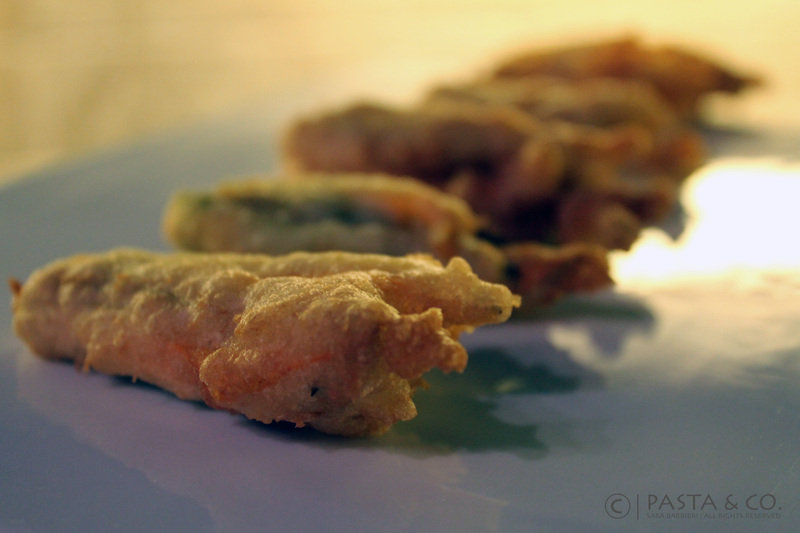 Zucchini flowers make the perfect appetizer if stuffed Roman-style with mozzarella and anchovies and deep-fried. Or plain. Or stuffed with burrata!! Yummy! 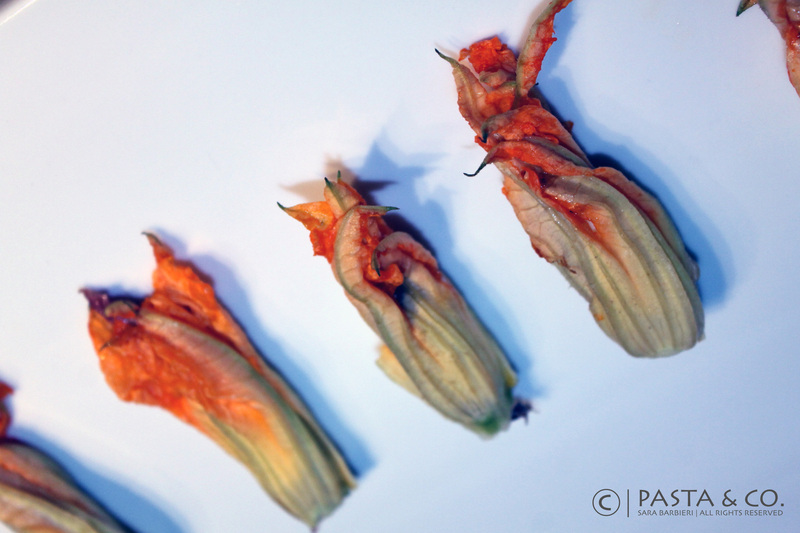 Remove the stem of the zucchini flowers. You can either use a tweezer from the top or cut the bottom and let the stem slip out. Wash the flowers carefully under cold water, and pat dry with a paper towel. Be aware of any little friend who might live there! Cut the mozzarella into strips 1/4 inch wide and carefully pat dry with paper towels. Slice the anchovies in half lengthwise. Insert a strip of mozzarella and the anchovy into each flower and close the blossoms rolling tight and twisting the end to keep the filling inside. Prepare the batter. Beat the eggs, add some flour, dilute with the beer. Repeat and whisk carefully until you get a dense, creamy texture. Bring to boil the oil in a tall saucepan. Check the temperature with a thermometer (or with the bottom of a wooden spoon: if you see frying around it, the oil is ready). Dip each flower into the batter, coating it completely, and place it into the hot oil. Gently turn it and it gets golden. I use a bamboo tong and I find it perfect. Remove and set on paper towels to absorb the extra oil. Serve the flowers in batches just as they come out of the pan, so they don’t get soggy. The beer must be VERY cold. You can even fill up a second, bigger bowl with ice and stack your smaller bowl with the egg batter in it. Use the blossoms as soon as possible, as they will wilt within a day!